The spring of 2018 was shaping up to be one of the best ever! 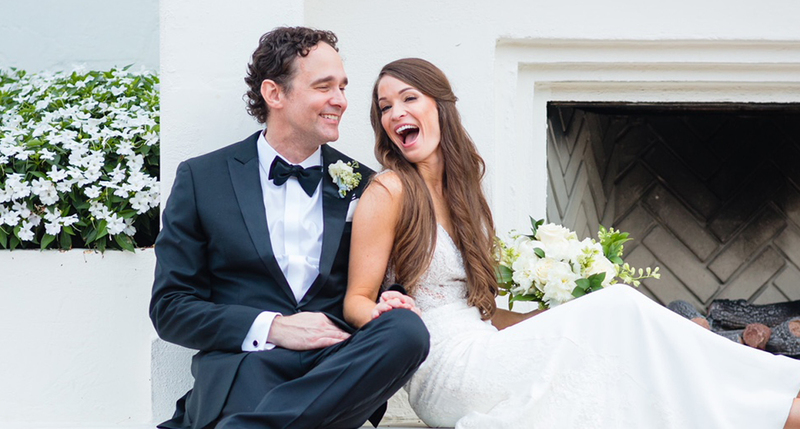 I was sailing through life and felt so happy about the plans and milestones ahead of me – but not just me, but for my fiancé, Mark, too! At 34, I was engaged to a wonderful man, and we were planning our wedding that would take place in the fall. Although Mark and I were both getting married later than many of our peers, it was our first time and the process was still exciting and special to us. I was soaking upevery single detail and experience with my family and friends. Everything was falling into place, and I felt confident that my life was on track. Mark was right! I wasn’t a statistic, I was a strong woman and I could beat this. But that initial confidence soon faded as I tried to come to terms with my new normal. I had so many questions and felt so lost without any clue of knowing where to even begin. I wondered what chemo would be like, how treatment would make me feel. I worried about losing my hair and how all of this would affect our wedding. I wanted desperately to take action and have a plan of attack, but had no idea what to do. It was during this time of uncertainty that I learned it was OK to ask questions, to ask for help, and to not have all the answers all at once. It was also during that time that I realized Mark’s words were still true, that we would get through this together, with the help of our families and friends, doctors and medical team. Beyond these familiar faces, I was in awe that so many women– members of the Sisterhood – that I didn’t even know personally reached out to me offering help and support. A day that stands out in my cancer journey is the day I met my surgical oncologist, Dr. Mindy Bowie. I remember her assuring me that she would be there with me, fighting every step of the way, for as long as it took. Her words made an impact on me, not just because it was reassuring to hear, but because she actually has been fighting with me and continues to be a big part of my support system. She helped ease my fears and helped me find answers to my questions. And while Dr. Bowie is very special to me, she is only one of many doctors at the Breast & GYN Cancer Pavilion who are so willing to help and provide support and comfort at one of the scariest moments in a woman’s life. I began chemotherapy on May 31, 2018. After that first treatment, Mark and I decided we didn’t want to wait until November to get married because we wanted to fight this together, wholeheartedly, as husband and wife. As a result, we threw together a wedding in a little over a week’s time. It wasn’t the huge soirée we had originally planned. It was so much more. As we stood there saying our vows, in front of our immediate family and closest friends, it became the most perfect, most meaningful wedding we could have ever imagined. I’m so grateful to have my husband beside me through the process. He has been my rock and always impresses me with his continued strength, compassion and much needed humor. As I continue treatments, the fear of losing my hair returned. 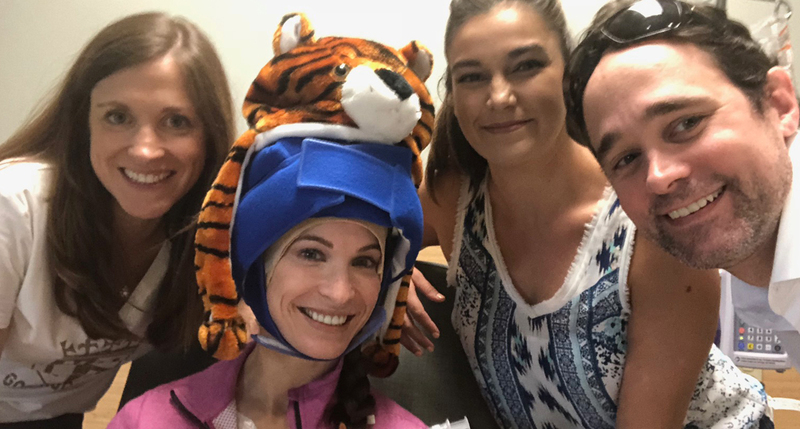 To combat this, I started cold cap therapy, a special type of therapy that uses a hat filled with a cooling agent to cool the scalp and reduce hair loss. I’m happy to say that the cooling cap has worked and helped me retain about 70% of my hair. My friends helped make the process better by providing different animal hats to place on top of the cooling cap. So now, each week, treatment is made better by a fun new animal that sits on top of my head. And while it makes me smile, I hope it can bring some happiness and laughter to others who see me. 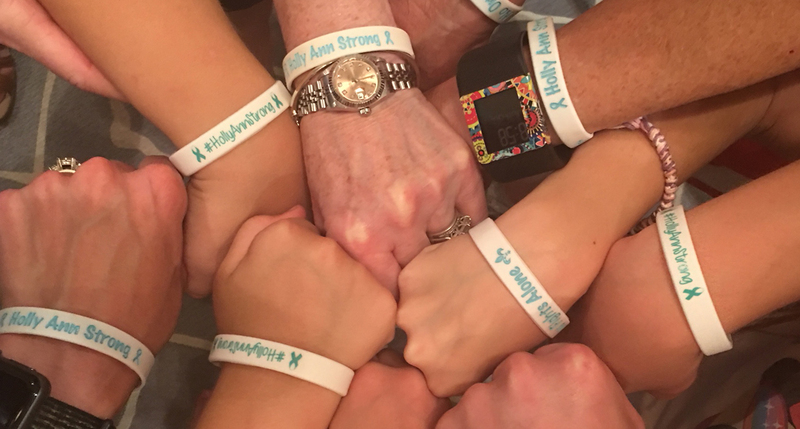 During that time, my friends also came up with #hollyannstrong, a hashtag created to keep me motivated. They took the hashtag and created bracelets for all of us to wear, and though a simple gesture, the bracelet reminds me of the group of people praying for me, fighting with me, and supporting me. Through it all, my friends have been such a source of positivity and inspiration. They have rallied around me and provided me with so much love and support. I can’t say that I feel lucky that I have cancer, but I do feel lucky that I’ve been able to experience the outpouring of love and compassion from so many people. I feel lucky that this diagnosis forced me to take a hard look at my faith and my priorities, and to trust in the plan that God has for our lives. I’m lucky to have a place like the Breast & GYN Cancer Pavilion so close to home and filled with so many wonderful people to help me along the way. I’m lucky to have such positive people be a part of my journey. And I’m lucky to still be here, to appreciate the simple things, to live every moment, and to love the ones I hold dear. My name is Holly. I am an attorney, a wife, a fighter, a survivor. And I am the sisterhood. 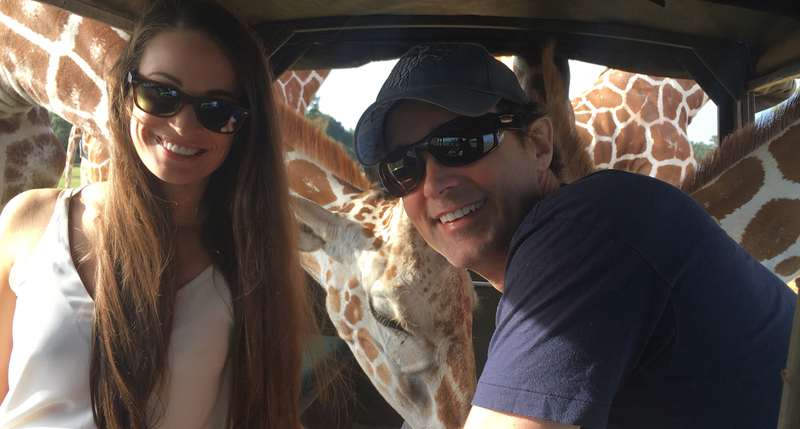 Follow along with Holly’s journey with her personal blog, click here!